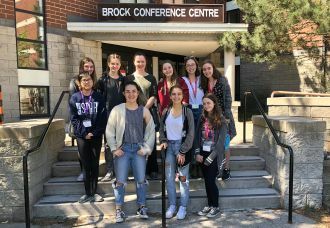 From May 10–13, 2018, the Linden Classics Club travelled to Brock University, where they participated in the 50th anniversary of the Ontario Students Classics Conference (OSCC), celebrating Greek and Roman cultures. The event brings together students and teachers from across the province. This year's event theme was inspired by philosopher and statesmen Seneca, who told us, "It is not because things are difficult that we do not dare, but because we do not dare that things are difficult." Linden students took his message to heart and participated in a vast array of athletic, academic, and creative competitions during the four-day event. Each competition was based on aspects of Classical life. They returned with several personal and team accomplishments, placing prominently in many of the contests. The Linden team embodied the spirit of the OSCC with their enthusiasm and spirit, cheering each other and their fellow competitors. The team's daring and willingness to try new things was an inspiration. Congratulations, everyone! And from the bottom of my heart, thank you for your help, creativity, spirit, and enthusiasm.